It’s in great location also the staff were very friendly especially ANITA the receptionist she was so kind I recommend the all to book this Hotel.. The location is phenomenal, 5 min walk to Deira City Center. The staff were very friendly and helpful. Both the morning and evening bell boys and the cleaning staff were helpful and friendly, able to answer anything we needed. We only stayed one night but could have easily stretched out for a long time and been very comfortable. Ms. Sualhin and Mr. Jonathan were the most helpful staff in this hotel. The room was excellent very neat and clean. Room service was great specially the guy name Muhammad Salahaddin was very helpful in room cleaning. Our hall the stay was good no any trouble the reception staff was ok but need to be more improvement. Convenience and accommodation Great worker and friendly housekeeper named Shakir for keeping our room clean and tidy. I wait 4 hours to get the key because they said need to clean it and after that wasn't the property which I booked and still not clean We found 2 cockroaches there rooms and corridor smell very bad. Pearl City Suites By Gemstones This rating is a reflection of how the property compares to the industry standard when it comes to price, facilities and services available. It's based on a self-evaluation by the property. Use this rating to help choose your stay! One of our best sellers in Dubai! 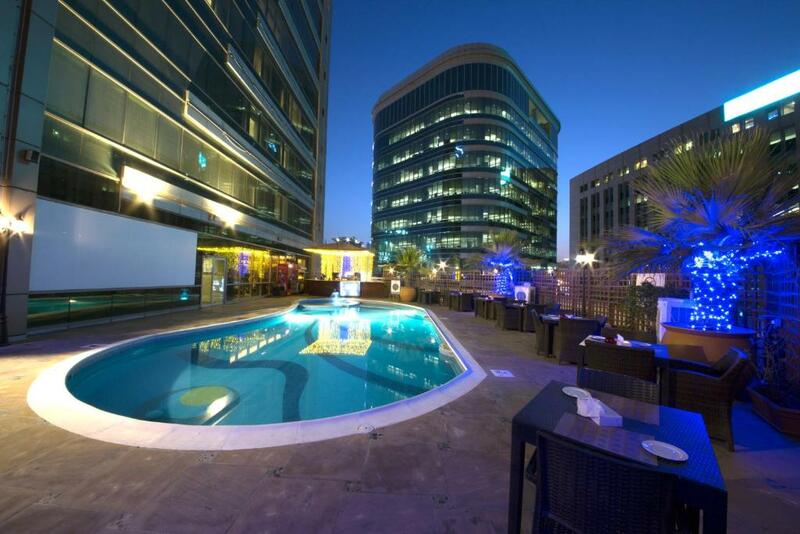 Less than 2 minutes' walk from Deira City Center and Metro Station, this elegant boutique hotel offers contemporary rooms and an outdoor pool. Pearl City Suite By Gemstones Hotel is decorated with hand-painted artworks and marble floors. Each room of Pearl City Suite By Gemstones Hotel offers a flat-screen TV and a spacious seating area with a plush sofa. All come with a well-equipped kitchenette and a dining area. Pearl City Suite By Gemstones Hotel has a fully equipped fitness center on site. After a work-out, guests can relax in the hot tub or the sauna. A 24-hour front desk is available. Free WiFi is available in the public area. The restaurant offers international and local dishes in a buffet style or à la carte. An international breakfast buffet is served daily. When would you like to stay at Pearl City Suites By Gemstones? This spacious one bedroom suite has a private bathroom with bathrobes, slippers, and free toiletries. It has a separate living room with a flat-screen cable TV, and a guest bathroom. It also has a dining area and a kitchenette with a refrigerator and a washing machine. This spacious one-bedroom family suite features an private bathroom with bathrobes and slippers. There is also a guest toilet and both include free toiletries. It has a separate living room, a flat-screen cable TV. It also has a dining area and a kitchenette with a refrigerator and a washing machine. This spacious 2-bedroom suite includes 2 private bathrooms with bathrobes, slippers, and free toiletries. It has a separate living room with a flat-screen cable TV. It also has a dining area and a kitchenette with a refrigerator and a washing machine. This suite has a private entrance, sofa and stovetop. This quadruple room features a sofa, dining area and tile/marble floor. This family room has a washing machine, stovetop and kitchenware. This apartment has a private entrance, bathrobe and seating area. Popular among solo travelers. Close to Deira City Centre. Located near shopping areas and the airport. It is walking distance attractions from hotel: Deira City Centre, Hamarain Centre, Dubai Tennis Stadium, Dubai Creek Golf & Yacht Club, Reef Mall and Dubai Creek. 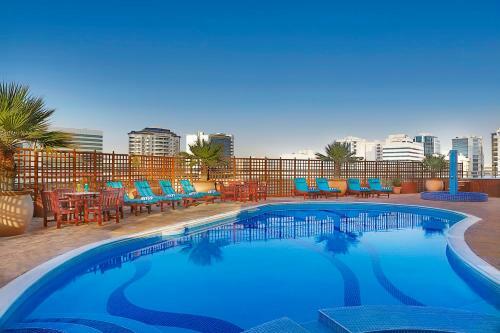 The "Pear City Suites" advantages are: wellness area, location, service, cleanliness, wifi, breakfast, food and room. The most advantages thing is the location of the hotel, as it is well connected with Metro and Bus services. Популярный среди одиноких путешественников. Рядом с центром города Дейра. Расположен недалеко от торговых районов и аэропорта. Он находится в нескольких минутах ходьбы от отеля: Центр города Дейра, Центр Хамарена, Теннисный стадион Дубая, Гольф-клуб и яхт-клуб Dubai Creek, Риф-Молл и Дубай-Крик. Преимущества «Pear City Suites»: оздоровительный центр, месторасположение, обслуживание, чистота, wifi, завтрак, питание и номер. Наиболее выгодным является расположение отеля, так как он хорошо связан с метро и автобусами. We have multi talented staff of various nationalities who can speak various international language. The come from hospitality background and are capable to handle all type of customers. As this hotel is family hotel due to which our staff are also selected by properly checking their background to manage the family standards of the hotel. Our hotel neighborhood is the quiet locality with one side attached with huge garden where families can enjoy the fresh air as well as the green environment. On the opposite side of the same is the famous shopping center "Deira City Center" where the customers all shopping, food and entertainment needs are covered. The metro station is just on the walk able distance and this hotel is well connected with the Bus routes. House Rules Pearl City Suites By Gemstones takes special requests – add in the next step! All children under 2 years are charged AED 75 per night in a crib. All children under 12 years are charged AED 70 per night for extra beds. Pearl City Suites By Gemstones accepts these cards and reserves the right to temporarily hold an amount prior to arrival. Guest must present an original passport or UAE Identity Card upon check-in. Please note that the property does not serve alcohol. Please note that all guests are required to present the credit card used to make the reservation. If the credit card's owner is not the person staying at the hotel, please contact the property in advance to request a third party credit card authorization form. For information on third party billing, please contact the hotel prior to arrival for further details. Contact information can be found on the booking confirmation. The hotel is authorized to take pre-authorization of the reservation 25 days before gust arrival to guarantee the booking. Gemstones Hotel Management will pre-authorize/purchase your credit card as this property is under Gemstones Hotel Management. All card transactions are subject to a 2.5% transaction fee on total payment amount over and above all other taxes and fees. All the staff are goo, supportive and helpful. Jonathan, and all the frontline staff have very good customer service experience, very supportive and helpful. No microwave in the room. The house keeping did not clean the cooking utensils and we were left with dirty dishes to clean and use everyday. The staff was kind and cooperative. The payment process was easy and the location is awesome! Room, kitchen, saloon, covers and beds was very dirty, the toilet smelled pee! furniture very old and dirty, basically the worst hotel ever!! We need to receive confirmation of booking before arriving to the hotel. Good location, nice place to stay, cooperative staffs, helpful and good services during all the days we stayed. Thanks to all the staffs. Location is excellent. From staff Syed Waqar and Mr. Numan is very cooperative and efficient.